The 2017 Ford Explorer is ready to take your driving adventures to a whole new level. The vehicle comes in three variants, such as Sport, Platinum, and XLT. The best version is equipped with the 3.5L EcoBoost turbocharged engine, with direct injection features. It produces 365 horsepower and 350 lb.-ft. of torque. The vehicle also has a strong towing capability of up to 5,000 lbs. It comes equipped with the Class III Trailer Tow Package, which includes an engine oil cooler, tow hitch, and wiring harness. It also features a rearview camera so you can see a video image of what’s behind you. Towing is also easier with the vehicle’s trailer sway and roll stability controls. 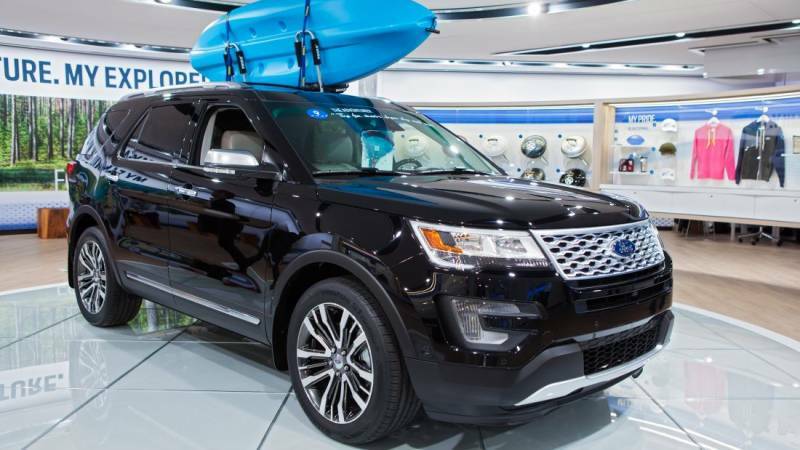 The cargo capacity of the new Ford Explorer is a total of 81.7 cubic feet. You have the option to fold the second and third-row seats for added cargo space. If none of the seats are folded, then at least 21 cubic feet of cargo volume is usable. Chairs are folded at a touch of a button. When it comes to safety, the Ford Explorer has everything covered. Driving this new vehicle is a breeze, thanks to its curve control and six-speed SelectShift automatic transmission features. Curve control slows down the vehicle to as much as 10 mph in about one second if you are going too fast on a curve. Along with throttle reduction and four-wheel braking, this new Ford is easier to control than most SUVs in the market. These same features automatically function on dry and wet pavements as well. The six-speed SelectShift automatic transmission feature makes it easier and quicker for drivers to change gears. The steering wheel-mounted paddle shifter gets you on the right track with less movement required. It also has an intelligent 4WD feature with terrain management and hill descent controls. This feature allows you to switch to any of the pre-set settings to match the terrain you are trekking. Choices include mud, sand, grass, gravel, and snow. The hill descent control feature allows you to set and maintain a constant speed when traveling downhill. Another good feature of the Ford Explorer is its adaptive cruise control. The sensors installed in this vehicle can detect if traffic is slowing. As such, the vehicle will automatically slow down. 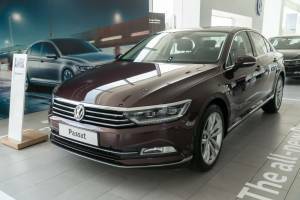 It also has forward collision warning with a brake control feature that alerts users of a potential collision with the car ahead of them. If it senses a collision, a heads-up display will be activated, and the brake lights will start flashing. Of course, all the airbags will be deployed if a collision does occur. Blind spots are also easily detected through the BLIS system with cross traffic alert. It uses a radar system to determine if a vehicle is entering your blind spot, which alerts you through an indicator light flashing in the side view mirror. As for entertainment, the vehicle comes with a 10-speaker audio system that features an 8-inch touch screen panel with USB and Bluetooth connectivity. The system also understands voice commands. It connects you to the SiriusXM Radio, which has over 150 channels of commercial-free music. The radio station also keeps you up-to-date with its news, sports, and entertainment channels. The closest rival of the 2017 Ford Explorer is the 2017 Honda Pilot. Performance wise, the Pilot provides a smooth, refined ride. The Explorer, on the other hand, offers that turbocharged feel that engages the curves of the road. The Pilot is powered by a 3.5-liter V6 running on 280 horsepower. The vehicle is also a 6-speed automatic 4WD. Its all-wheel-drive system adjusts the rear-wheel torque to make turning into corners fast and easy. The Ford Explorer runs on a turbo-4 V6 engine that produces 290 horsepower. It generally offers the same features but with a sport-sedan level straight-line performance. The advantage of the Explorer over the Pilot is its quick steering and firmly tuned ride. But as far as accommodations are concerned, the Pilot wins. It can seat a maximum of eight passengers, compared to the Explorer’s seven. The seats on the former are also more comfortable and offer more legroom. The Pilot’s storage behind the third-row seats is also larger. The improved fuel efficiency features of the 2017 Ford Explorer are very notable when compared to SUVs of the same league. Its 290 hp 3.5-liter V6 6-speed automatic is rated by the EPA at 17 mpg city, 24 highway and 20 combined. The 2017 Explorer’s 2.3-liter inline-4 version is more efficient. Its EPA is rated at 19 city, 27 highway, and 22 mpg combined. The AWD is rated at 18, 25, and 21 mpg. This version can tow up to 3,000 lbs worth of cargo, too. This is the most fuel-efficient version of the new Explorer. 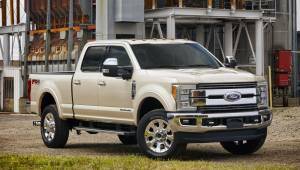 The least efficient are the ones with the 3.5-liter EcoBoost V-6 type engines, which are found on the Sport and Platinum models. Their ratings are at 16 city, 22 highway, and 18 mpg combined. While not green, they rated much better than the old V8 Explorers. The 2017 Ford Explorer is loaded with features that make your driving experience excellent. With all the features listed above, it is easy to see what makes this vehicle a very good buy. The new Ford Explorer is perfect for all road conditions, good and bad. It makes off-road driving almost a breeze. However, there might be some details that could bug you, like no manual gearbox included. Also, the third-row seats have limited legroom, which could lead to the bigger kids complaining about it. The Ford Explorer is also on the little too expensive side if you’re one frugal car buyer. Its base price can balloon to $36,000 if you want all the car’s cool features loaded in. The performance-driven Sport model costs even more. The tires can also be an issue if you’re not used to the big 20-inch types. If you are used to driving SUVs with 17-inch tires, learning the ropes on this one can a bit of a challenge. You might feel that they don’t ride as smoothly as the smaller tires. It takes a little getting used to. Aside from that, the bigger tires are more damage-prone off-road. They also don’t perform as good in mud and sand. These are what you will get from the all-new Ford Explorer. It’s a great car if you’re looking for a comfortable, safe, and feature-rich performance vehicle. Consider these features if you are looking for a family car that can take you practically anywhere. Weigh the pros and cons. Check if the budget suits your finances. If all is a go, then go out and do a test drive. That’s how you’ll know if the vehicle is indeed the best fit for your needs.